Last year, we launched the Outlook.com beta to bring you a faster, smarter, and more personalized inbox. We’d like to thank the millions of people who opted into the beta over the last six months and provided valuable feedback. 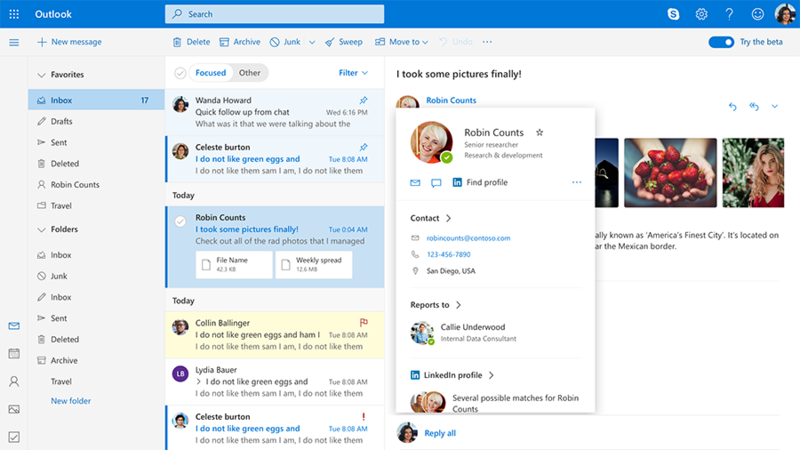 We’re wrapping up the first phase of the beta by rolling out the new Mail experience to all Outlook.com users and launching new beta experiences in Calendar and People. Mail—The fresh new look of the Mail experience will now be standard for all users—no need to toggle in! You’ll get a speedier performance, improved Skype integration, new ways to access your favorite add-ins—such as Boomerang, Evernote, and PayPal—and easier ways to categorize and filter your emails. We’re rolling out this Mail experience to all Outlook.com users over the next few weeks. Calendar—All Outlook.com users can now try out new beta experiences in the Calendar. This includes a more responsive interface, the ability to add an event in just a few clicks, and icons to help you identify your events faster. 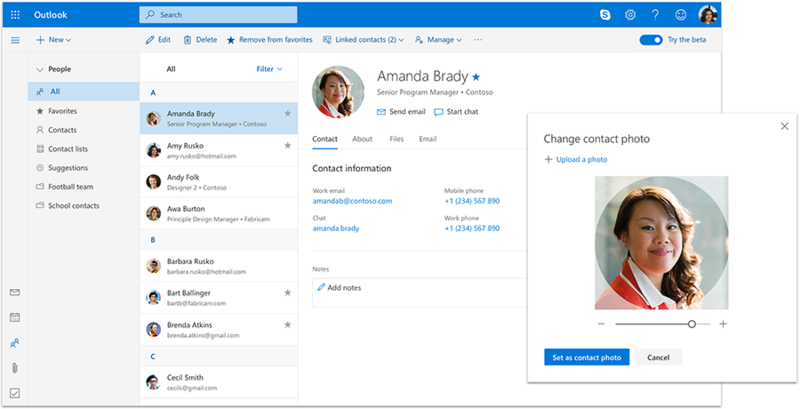 People—You can also try out beta experiences in the People section of Outlook.com, including a new look, quicker access to your favorite people, and easier ways to view, edit, and create contacts. Simplified add-in experience—With the new Mail experience, we’ve simplified the way you access add-ins, while giving you more control. Outlook add-ins bring your favorite apps right to your inbox, so you can accomplish tasks faster—including saving an email directly to your notebook, translating emails on the fly, paying your friends, or sending them a gift of coffee. With Outlook.com, you can access popular apps and services like Boomerang, Evernote, GIPHY, Gfycat, Microsoft Translator, MojiLaLa, PayPal, Trello, and more right from your inbox. 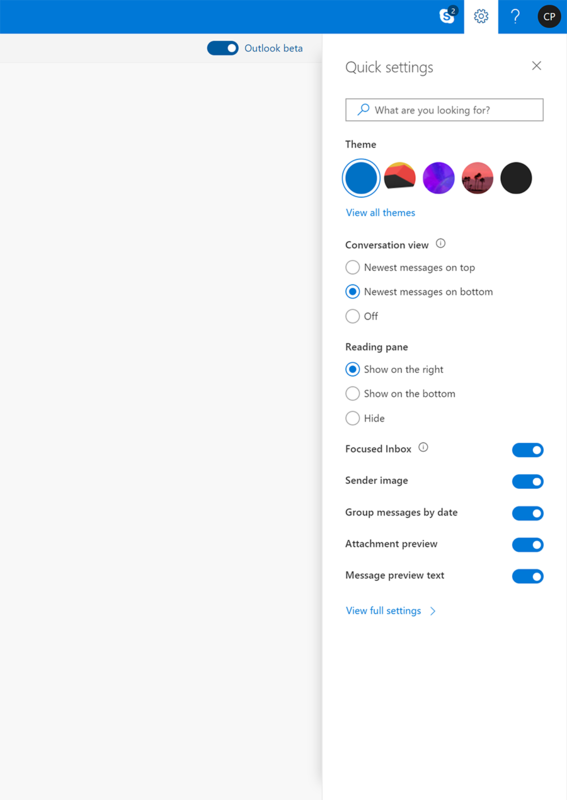 To try out these new experiences in Calendar and People, you can opt in to the beta by switching the Try the beta toggle on the top right of your inbox. We hope you enjoy these new experiences we’ve brought to Outlook.com. 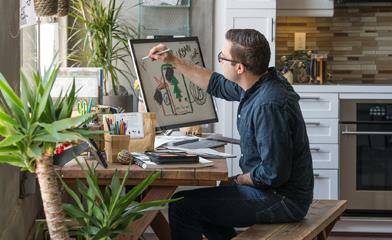 There is more to come, and we need your help as we work to make Outlook.com better and better. Your feedback so far has been amazing, and we love reading and implementing it, so please keep writing to us in our UserVoice channel with your suggestions and ideas. Q. When will the new Mail experience show up? A. 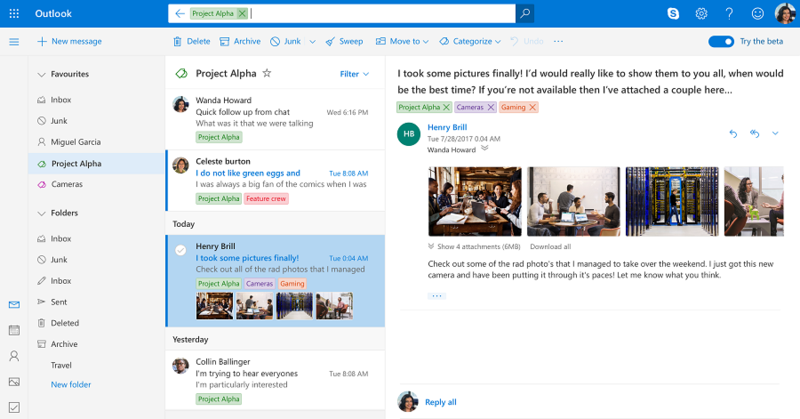 The new Mail experience will become the standard experience for all Outlook.com users over the course of the next few weeks. If you want to try it out earlier, just slide the Try the beta toggle on the top right of your inbox. Q. Why isn’t the toggle in the Mail experience switching me back to the classic experience? A. 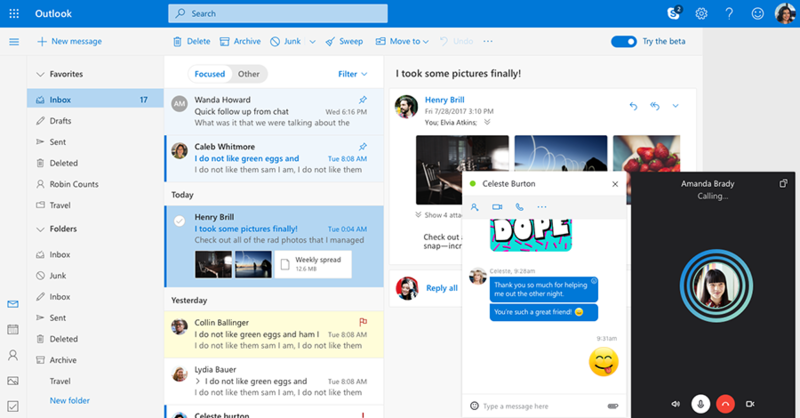 As the new Mail experience becomes the default for all Outlook.com users, the toggle will no longer switch back to a classic experience. It will give users access to additional beta features we’ll try out in the Mail experience over time. Q. How do I try the beta experience in Calendar and People? A. The Outlook.com beta experience is controlled by a universal toggle that can be accessed from multiple pages. 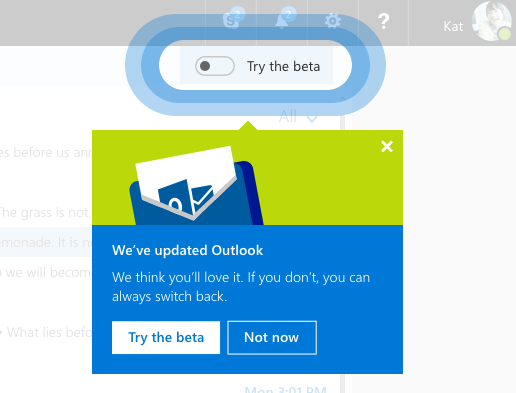 To access the beta experience for Calendar and People, just switch the Try the beta toggle in the top right of any screen in Outlook.com. You’ll see new beta features whenever you interact with Calendar and People. You can use the same toggle to go back to the classic experience. Q. How do I pin add-ins in the new Mail experience? A. To pin frequently used add-ins, click the gear icon > View full settings > Mail > Customize actions and then select the add-ins you want.